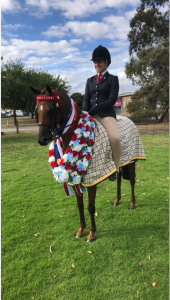 I recently attended the Warrnambool Agricultural Interschool Dressage and Showjumping event for 2018 and witnessed three of our fine students: Sophie Kate-Shaw, Su-Ri Kim and Emily Buckland compete. 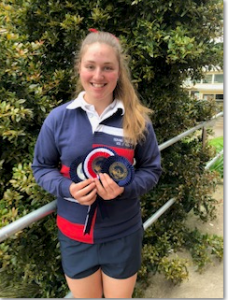 All three competed brilliantly with Sophie Kate-Shaw being awarded overall secondary Champion on the day. We often speak about Football, Netball, Athletics, Swimming etc. but rarely anything to do with horses. All three girls clearly demonstrated many hours of preparation for the event, including enormous support from home. We should be very proud of all three girls who represented the College with high distinction. At the conclusion of the event, I took the opportunity of asking Sophie a few questions about life and her Showing/Dressage commitments. What do the competitions involve from you and your family? What kind of competitions are we talking about? So how do you manage to fit everything in- to gain any sort of work or life balance?